How to build your dream business from home, even if you don’t know where to start. No magic bullets, just real strategies and advice for aspiring entrepreneurs. 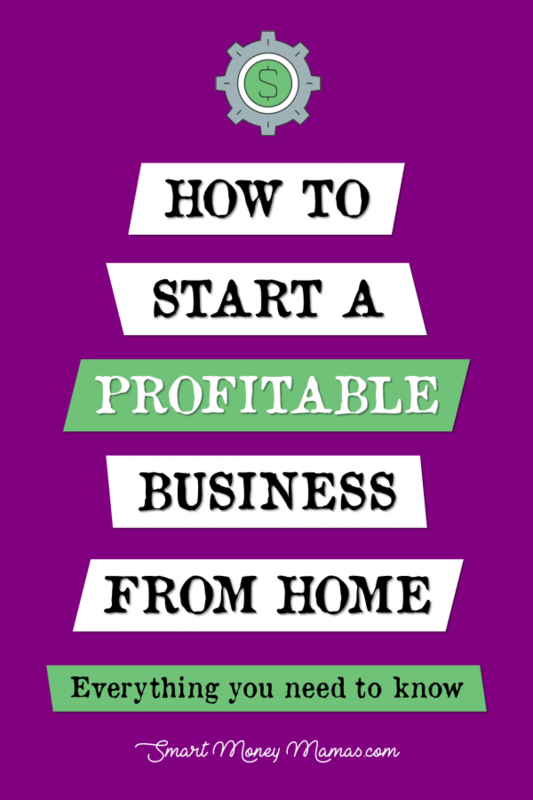 Do you want to start a profitable business at home? No, really, do you want to start a successful business at home that can supplement the income from your career or replace your career entirely? Do you want the ability to fully control how much money you make, when you spend time with your family, and the impact you make on the world? Then this guide is all you need. But before we dive in, let me warn you. This is not a “start a business in the next five minutes” or “start a business and instantly make a billion dollars dropshipping key chains from China” post. Because those things are selling lies. In the next five minutes you can start a blog or purchase a $1,000 course. But that won’t give you a business. That will give you a thing that can become a business, once you take the time to actually plan, consider your goals, and do the work. I want to protect you from wasting money and hours, months, or years of time hustling for a business that isn’t right for you. From facing setbacks you could have avoided had you asked the right questions. From buying thousands of dollars of MLM inventory your friends don’t want. Then let’s think and plan before we jump. Here’s what you need to do. 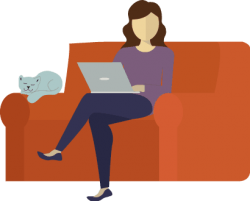 Everything you need to choose and start a profitable business from your couch. Owning your own business has become a status symbol. But it’s still a huge undertaking and not one that should be approached without understanding your personal goals. People have a million and one reasons for starting a business at home. Do you need extra money quickly? Do you have a passion project you want to explore? 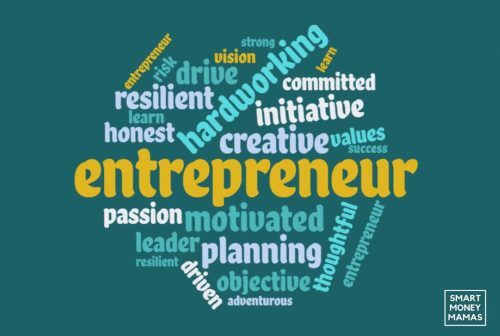 Have you always wanted to be an entrepreneur? Do you want to quit your job? Are you having trouble finding a job? Finding the root of your desire to start a business is important. And I want to tell you why. 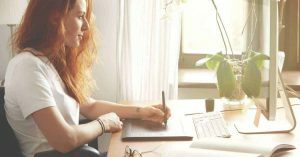 If you need money quickly or are looking to develop a skill to help you get a job, you might be better off focusing on freelancing business opportunities as opposed to selling a product. As freelancing as a contract employee is easier to grow. If you want to explore a passion project, you may be more comfortable monetizing slowly and developing your skill and business model. If you want to leave your job, you know you’ll need to hustle building your business on the side for a while. Or grow a nest egg to give you time to grow your profits. There are so many business models, and choosing the right one depends on your needs. We’ll talk about this more in the next section, but just because something can make money, doesn’t mean it is the right business opportunity for you. Second, knowing your motivation will keep you moving through the tough times. Starting a successful business means working through the mistakes and set backs. Understanding why you started your business, and what it means to you, will help you make smart choices when it comes time to make trade-offs. Something all entrepreneurs need to do. Whatever you do, don’t make your primary objective making a boatload of money. If your primary objective with your business is to make a boatload of money, you’ll probably fail. Or, you’ll succeed for a while, until someone catches on, swoops your audience, or a social media algorithm changes. People today are trained to spot ads. We are inundated with them and can spot them a mile away. Yet, people are still searching for community. We are drawn to passionate people that care about their customers and the impact they have. So be that person. Start a business because you have something you truly care about. It will be infinitely easier to get other people to care too. Entrepreneurs are a unique breed. They are passionate and determined. Committed to a dream even when faced with incredible odds. They’re self-motivated, hard working, and good planners. They know what needs to get done, what doesn’t, and they do the work. Entrepreneurs love to learn new things. They seek out knowledge through books, podcasts, networking, and whatever they can get their hands on. They’re willing to take risks most wouldn’t. Picking up the phone to cold-call the 100th potential customer even though the first 99 said “no” before they could even get their whole pitch out. 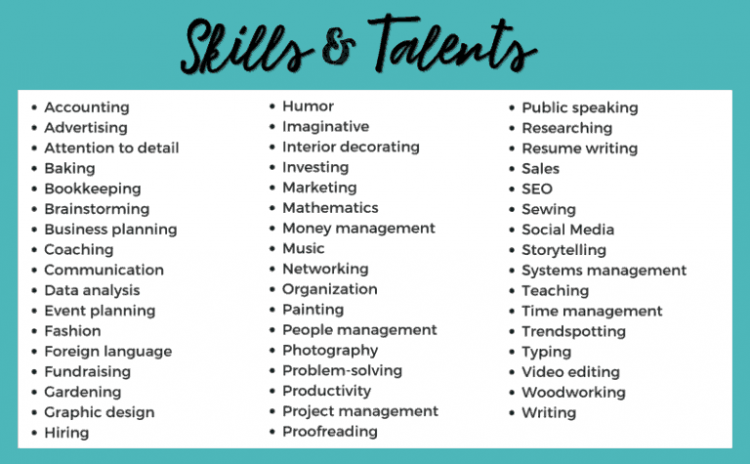 Just because your business is home-based and not necessarily aiming to be the next Snapchat, doesn’t mean you don’t need these skills. In fact, you might need them even more. Because each day you’re going to be faced with your competing priorities side-by-side. Finish your work or read a book to your toddler? Watch Parks and Rec on Netflix before bed or develop your next product? If you need someone looking over your shoulder to make sure you get things done, starting an at-home business might not be right for you. Or you may need a partner to keep you on track. As you go through developing your business in this post, you’ll be repeatedly ask to consider your skills. Be true to yourself. And never start a business because you think it’s the easier option. The “easy” days take time to come. Those stories littering your Facebook ads with people making $100,000 a month dropshipping, blogging, selling painted rocks working 3 hours a week? You can make amazing money with an at home business. But it is going to take work. Unlike working for someone else and getting paid for your time, there will be hours and weeks or months when you’re scared to calculate your hourly profit because it would be so depressing. When you’re feeling defeated because you heard a “no” from the tenth pitch that day. If you prepare yourself to fight through that struggle, you can build a profitable business. You’ll pivot when you need to, celebrate your wins, and ignore the naysayers. You’ll do the work. Why say this now? At the beginning of a “start a business” article? Because I want you to be prepared. I don’t want you pouring time, effort, passion, and money into something for a month and then giving up. Thinking that not seeing immediate success is a sign of failure. Once founders find success, many discount the massive effort it took them to get there. It’s often unintentional, but it sends a mixed message to those that come after. As you start your journey, remember that in 1886, the first year of Coca-Cola, the founder Pemberton sold $50 worth of the drink and spent $73.96 on advertising. And that JK Rowling was rejected by 12 publishers before she found one that would publish Harry Potter. You can do this. If you are committed. Still with me? Let’s choose your business! There are endless ways to create a profitable business from home. But to find success, you need to choose the business model that is best for you. 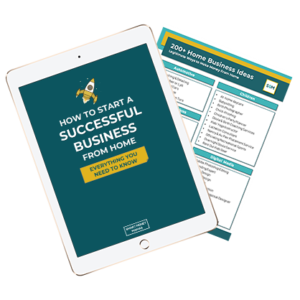 Already have an at-home business idea? Don’t skip this section. And I’ll tell you why. There are hundreds of ways to make money from home. But just because a business idea can make money, doesn’t mean it is the right business for you. Most entrepreneurs test many ideas before finding the right fit. Your first venture probably won’t be your last. Yet, there are ways to narrow in on a strong option from the start. And what makes the right fit? I built a freelance writing business to $7,000 a month in profit in five months. There is demand for writers, the finance industry pays writers well, and I enjoy doing it. Now, does that mean my husband should become a personal finance writer? He hates writing. It’s not at all enjoyable or fulfilling for him. And he has no desire to build a deep knowledge of budgeting, credit cards, or IRAs. However, if he wanted to, he could work as a freelance construction estimator. Or build a website to review board games. Or restore and flip small machinery. Those are skills he has that I don’t. And they are things he legitimately enjoys. When choosing a home-based business, we want to do a few things. You should run through this exercise whether or not you already have the perfect idea. Maybe this exercise will help you discover an idea even better than the one you have now. Maybe you’ll flesh out that little idea in the back of your head so you can move forward with more confidence. And, hopefully, you’ll find a profitable at-home business idea that you can stick too. We all have unique skills. Or a natural ability that can be developed into a unique and valuable skill. And before you get all, “I’m not particularly good at anything,” on me, let’s remember that we’re usually our own harshest critics. We might need an outsider’s opinion, or to step out of our normal, self-critical box, to identify our skills. What traits do employers or teachers usually list as my strengths in performance reviews? What things do people always ask me for help or advice on? What tasks do other people find hard that have always seemed easy to me? What skills have I developed or practiced in my life so far? If I asked my three closest friends what I was best at, what would they say? Make a list of all your skills and talents. Then, narrow it down to your top five or ten. These are ideas that can serve as the base of your business, as you can likely add value for people who don’t have your skill set. But, talent isn’t the only thing. So, hold on to your skills list and let’s tackle the next step. Most of the time, we enjoy things we’re good at. But that’s not always the case. You may be fantastic at proofreading people’s grammar, for instance, but doing so might frustrate you. Similar to your skills list, narrow down your interests to the top five or ten. Now, you’re ready to brainstorm. With your skills and interest lists in front of you, find a quiet place to write down every business idea you can think of related to at least one item on your list. Don’t give yourself too much time to work on this exercise. You will almost certainly overthink it. Here are some guidelines. Don’t censor yourself. Write down everything that comes to mind. Try to come up with at least 10 ideas. Next, cross off anything that doesn’t particularly interest you. Remember you’re going to be doing whatever you choose quite a bit, so you want to be excited about it. Hopefully, at this point, you have two to four of your best ideas left. Now, you’re ready for the final stage. We’ve all had, or heard, terrible business ideas. For each of your top business ideas, take some time to map out what that business might look like. We’ll do this in even more detail by creating a business plan once you choose your top idea. But for now, sketch out the basics of each of your top choices. Are they willing to pay for your service? How much do similar products or services sell for? Is that amount able to support your income goals? Would your business require any permitting or special equipment? Is there a way to get started without a major investment in those things? Do you need any specific education or training to make your business successful? How much would it cost? Which of your business ideas best align with your “why I want to start a business” goals? 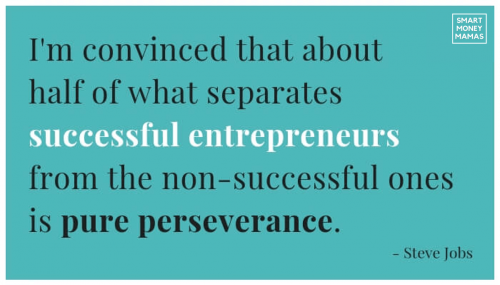 There are no guarantees in entrepreneurship. This level of planning and consideration won’t definitely make your business profitable. But it will help you avoid sinking money and time into something without first knowing what your challenges will be. Based on your basic ideas for your top business, choose the one that you are (1) most excited about and (2) seems to show the most promise for success. Next, you’re going to dive a little deeper. With so many items on your to-do list, a business plan helps you focus on the things that will actually help you generate a profit and grow your business. 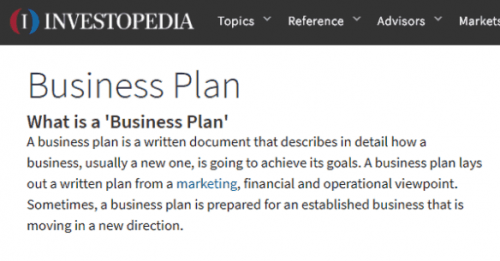 Yes, you should actually create a business plan. No, it doesn’t have to be 40 pages long and bound in a pretty spiral notebook from Staples. No, you don’t need any business education to write one. No, the 10 minutes you thought about this idea waiting in line to pick up your kids from school doesn’t count. A business plan organizes your strategy. It will help keep you focused on the things that actually grow your business instead of being distracted by lots of shiny objects. A business plan can help you prioritize goals. It will impact your branding – letting you choose a brand design that caters to your ideal customers. And it will force you to be thoughtful about how you will get where you want to be. If you want to be an entrepreneur, treat your business like a business. Have a plan. Your business plan doesn’t need to be as detailed, or have as many components, as a full plan being submitted for a Small Business Association loan or for venture capital funding. But main concepts to think about are the same. Here’s what should be in your business plan. Company Description: Your mission, the customers you will support, services you will provide, and why you’re uniquely prepared to do that work. Market Analysis: Details on who your customers are and what their businesses and budgets look like, who your competitors are, and how much your competitors charge for similar products or services. Service or Product: Explanation of what your business will sell, be it a service like video production or a product such as engraved cutting boards or an online course. Marketing & Sales: How you plan to reach your ideal customer and build a reputation for your brand. Social media, advertising, networking, etc. Funding or Investment: Most at-home businesses won’t be looking for outside funding like a traditional brick-and-mortar business. But, this is where you decide what your budget is for start-up costs and building your business in the first six to twelve months. Financial Projections & Goals: Once again, this is going to look a little different from a traditional business. You don’t need financial models. But you can think through goals – like reasonable milestones to hit in the first month, quarter, six months, and year. When I transitioned to working on Smart Money Mamas full-time and turning it into a business, I created a four page business plan. It isn’t overly detailed and it does shift and change. But it helps keep me focused and gives me a place to check in when I’m feeling stuck. A business plan isn’t the last definition you’ll ever have for your new company. However, you should commit to it enough that you give yourself the opportunity to make it work. Flex, adapt, and grow before abandoning your plan for something completely new. Pinterest never expected their platform to turn into the search and discovery engine it is today. It was meant to be a place to create digital vision boards. Yet, as they saw greater potential the way users were naturally using their product and they adapted. Your company’s brand – from your name to your logo and colors – will be your first introduction to potential customers. Make sure it reflects your mission. Your brand is your customer’s first impression of your business. It represents your personality, mission, and product or service. Branding may seem like a design decision, but at it’s core it’s about your company’s direction and place in the market. Your customers will see your logo, land on your Facebook page, or visit your website and immediately get an idea about you. Your brand is your chance to influence those first thoughts. By deciding on branding now, you can establish consistency across all the ways you communicate with your customers. That consistency solidifies your company in people’s minds, making it more likely that they remember you and come back. The name, colors, logo, and website you design at the launch of your business is unlikely to be your last. Especially as you grow and have the funds to invest in professional design. But careful thought from the start allows you to influence your reputation early on. Which can be a powerful advantage. We think being witty will help us connect with our clients or customers. Except, a lot of the time, it does just the opposite. No one knows what we mean. Branding for small businesses is typically far more successful when it is immediately clear what the company does. It gives customers clarity and helps them make a quick `decision about whether or not you can provide a service they require. Use a name that makes it clear what you do. Clever or non-specific names, like Nike or Zappos, take an expensive marketing budget to inform the market. Avoid hard-to-spell names. You don’t want people searching for your website, but unable to spell it. Definitely avoid made up words for this reason. Say it aloud. Test out saying the name over and over. See if it sounds odd, doesn’t roll off the tongue, or is too long. Conduct a complete internet search. See what comes up in a basic Google search, on social media, or other platforms. If there is an established brand in the market with a similar name, you might want to choose something else. Check for trademarks. You need to know whether your prospective name violates any current trademarks. You can search this at the USPTO. Get feedback on the name. Ask friends and family what they think of the name. They might notice something odd you didn’t. Give the name of your business careful thought. Instead of choosing the first thing that pops into your mind, make a list of many potential names. Write freely, without trying to judge the name during your brainstorm. Next, narrow down to your top three to five choices. Make sure the domain name and social media profiles are available at NameCheckr. You Don’t want to get attached to a name only to find out it isn’t available. Finally, ask family, friends, or contacts on social media to weigh in on what they think about each name, what they think a business with each name would do, or a simple poll to tell which is their favorite. This is an especially effective exercise if you can poll people that fit in your ideal customer demographic. According to Chris Ducker, author of Rise of the Youpreneur, naming your business after yourself gives you flexibility. If you plan to build your business around your personality, creating a brand and influence with you at the center, naming your business after yourself doesn’t lock you into one business model. It doesn’t pass the clarity test, but it doesn’t confuse people like a unique name either. As you grow as a person or your interests shift, you can add on new parts to your business and it can all fall under the umbrella of your name. Alternatively, an analysis of naming studies by Harvard Business Review found that while including the founder’s name in the business name can be related to higher profitability, it is also linked to reduced valuations. Including your name in your business name is great for businesses that want to create more of a community or family feel with their customers. Yet, potential buyers of the business see it as more tightly knit with the founder’s personality, and value it less without the founder there. So, really, it depends on your goals. If your business is synonymous with you and you never plan to sell, a business with your name can be a great choice. But if you might look to sell in the future, when you’re ready to retire, perhaps, a less personal name could suit better. Important Note: It is never too early to start thinking about the end goal for your business. In other words, if it could or should exist without you. Many entrepreneurs delay this decision until they are ready to sell or retire, and it can leave significant value on the table. Do not commit a ton of time to creating a logo when you’re new. Hold on. Let’s play that again. UNLESS YOU’RE A GRAPHIC DESIGNER, do not commit a ton of time to creating a logo when you’re new. Your logo can be updated as your brand grows and develops. And paying someone to make a high-quality custom logo for you can cost hundreds of dollars you might not want to invest right at the start. Instead, make some simple decisions. What Color Scheme Do You Want For Your Business? Colors evoke different feelings in your potential customers and clients. Your branding colors can convey whether your company is feminine or masculine, expensive or affordable, youthful or mature, and much more. These are a few examples of color meanings. Flip through sample color combinations or make a Pinterest board of brands in your target space with designs you like to find your color scheme. Do You Want a Graphic or Text-Based Logo? While we often think of logos as images, like Starbucks or Target, not all companies need a graphic image representation of their brand. Coca-Cola, FedEx, and Google all have logos just focused on the text design of their name. Decide if your logo needs a graphic representation or if you should stick to something simple with just your name in a certain font or design. 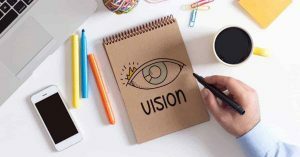 Once you have a sense of what you generally want your logo to look like – colors and design type – you are ready to either make it yourself or purchase a logo. You can purchase a logo design on Fiverr for $5 and have what you need in one to three days. If you find yourself design challenged, or just don’t want to create your own logo, this is a great way to go. Before hiring someone on Fiverr, however, make sure to read their reviews. Some providers are better than others. And the clearer you can be about what you want the easier the process typically is. If you want to create the logo yourself, check out any of these free tools. Hatchful from Shopify: Choose your industry, select which visual styles you want your business to represent, then enter your company name. You’ll see dozens of logos generated that you can customize to your needs, then download for free. Canva: Canva is not specifically a free logo generator, but under “marketing materials” you can design a logo. There are multiple starting templates to customize from and you can download the finished product for free. Logojoy: Similar to Hatchful, select logos you like, choose your favorite colors, and identify your favorite icons. Logojoy will generate suggested logos for your brand that you can customize further. Once you have your logo, make sure you have downloaded it both with a plain and transparent background. The transparent background will make it easier to use your logo on your website, social media sites, and other marketing materials. It’s 2019, ladies and gents. You need a website. Luckily, setting up a website isn’t hard. Or expensive. Bluehost offers web hosting from $3.95 a month including your domain name and an email account. With one click install of WordPress, you can be set up to customize your site in minutes. If you’re business provides a service or sells a product, check out these 30 free WordPress themes for small businesses. They are all mobile-responsive, meaning they still look good on a smartphone. An important factor when most people are surfing the web on their phones. Alternatively, if you are looking to start a blog or podcast, visit Do You Even Blog’s start a blog guide for complete site set-up and getting started tips. Important Note: As you set up your site, remember to only use photos that are free for commercial use, photos you have paid for, or your own photos. Otherwise you will be in breach of copyright. You can find free images at Pexels or StockSnap. You can also purchase images from sites like DepositPhotos. You don’t need an incredibly complicated website right at the start. But you want to make sure that the information people need is readily available. Here are the four pages to build out first. Home Page: Your home page should include a quick snapshot of who you are, what you do, and how people can contact you. If you have customer testimonials, include one or two to convey authority and experience. About Page: This page should give a more detailed look at your business, your experience, and why people should work with you. Include a photo of yourself. Services Page: If you’re selling a product or service, outline what you offer, list prices (or let people know how to get a quote), and include examples of your work or testimonials if appropriate. Contact Page: Let potential customers know how to get in contact with you and include a contact form so they can email you easily. You can add to your site over time, if you wish. Just make sure that the most important information is available to potential customers from the get-go. Like how to contact you. Social media is one of the best ways to connect with potential customers and get your name out there. Even if you don’t plan to start using social media yet, you want to claim any accounts you might want to use in the future. This can include Facebook, Instagram, YouTube, Twitter, LinkedIn, and more. Before signing up for any accounts, however, make sure that your chosen user name is available on all platforms. Tools like NameCheckr will let you do this all in one place. If your full business name isn’t available on one platform and you have to use a variation, try to use the same variation on all sites. This will avoid confusion for your future customers and make it easier to tell people where to find you online. Progress Check-In: You have your business idea, business plan, and you’ve named your new company. Your branding is set up with colors, logo, website, and social media profiles. You’re almost ready to launch! But before you dive into finding customers, you have to protect yourself and avoid any trouble with Uncle Sam. Taking care of the legal and accounting sides of your business might not seem like the most fun, but it’s a part of entrepreneurship you can’t ignore. It’s time for one of the downsides of being a rockstar entrepreneur. At a job, someone else deals with the paperwork, red tape, accounting, billing, and paying taxes. When you’re an at-home entrepreneur, that’s all on you. Don’t worry though, it isn’t as complicated as it might seem. There are tools to help you through it, and getting prepared ahead of time can avoid headaches down the road. Let’s start out with a disclaimer that makes all real lawyers cringe – I am not a lawyer and this section is just to inform you about your options in choosing a legal structure and how it might impact your business. Your company’s legal structure determines how you need to report profit, how you pay taxes, and, most importantly, how your assets would be treated if your company was ever sued. For most at-home businesses owned and operated by one person, the main legal entity options are a sole proprietorship, Limited Liability Company (LLC), or an S-Corp. And since an S-Corp doesn’t make sense unless you’re making significant income and can pay for someone to deal with the admin side, we will focus on the first two options. 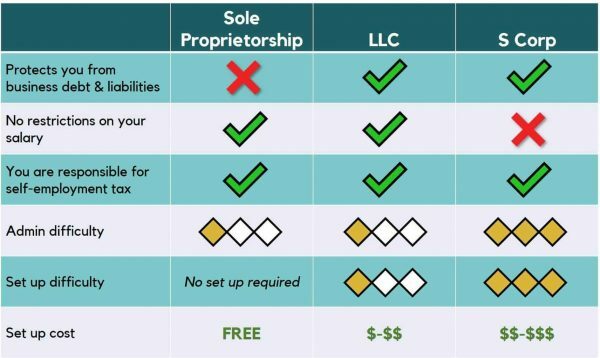 So, what is the difference between a sole proprietorship and a limited liability company? A sole proprietorship is the easiest business to start, you just start working. You are the business! It is owned and operated by you and all profits are taxed as personal income. A sole proprietor isn’t required to separate their personal and business expenses. You’ll fill out a Schedule C Form 1040 during tax season to account for your profits. So, that sounds easy! What’s the downside? You have zero legal protections. Your personal assets – house, car, investments, savings – are at risk if your business racks up a debt you can’t pay or faces a lawsuit. Alternatively, a Limited Liability Company (LLC) is the midway point between a sole proprietorship and a full corporation. The LLC is made up of “members”, another word for owners, and it protects the personal property of the owners from liability. However, profits are still taxed as personal income just like in a sole proprietorship, which makes the accounting needs less burdensome. The downsides to an LLC is that you have to register to do business. The paperwork is relatively easy to fill out, but you will have to pay a filing fee. For instance, in Connecticut, I had to pay a $120 fee to form my LLC. In addition, to maintain the protections of an LLC, personal and business expenses need to be kept entirely separate. Many small businesses operate as sole proprietorships for years. Or, small business owners decide to operate as a sole proprietor until they make enough to afford the costs of filing an LLC. Either is a valid option. However, you should consider your risk in facing a lawsuit. In businesses where you are assuming greater liability with people’s health or finances, you’ll want the protection of an LLC. Personally, I operated this site as a sole proprietor for the first year, then formed an LLC. The paperwork is to form an LLC is easy to fill out and can be found on your state’s website. However, if you’re nervous about completing the information on your own, a local business attorney can help you get set up. Or, services such as IncFile can walk you through the process and file the paperwork for you for just $49. Just remember that if you do choose to form an LLC, you have to keep your personal and business finances entirely separate. “Comingling funds”, meaning paying personal expenses from your business account or getting paid by clients to your personal account, can break the legal protections of your LLC. As was just mentioned, if you have an LLC, you need separate business bank accounts. But even if you have an LLC, I recommend getting separate accounts. Because it makes tracking your finances significantly easier and faster. It allows you to see start-up expenses and remember to use those built up expenses to reduce your tax liability when you start earning income. And it forces you to think about new major investments in your business, because you’ll have to transfer money from your personal account. If you chose to operate as a sole proprietor, you will need to register your business name with your county or state to open a business bank account. The bank will ask for a copy of this paperwork to complete your application. Choose a small business account with low or no fees and fund it with the amount you’re prepared to invest in starting your business. Citizens Bank Clearly Better Business Checking: No fees or charges up to 200 check transactions per month and no minimums for business checking accounts. Spark Business Capital One: Spark has no-fee checking and savings accounts for businesses as well as a Spark Cash Select credit card with 1.5% cash back and no annual fee. This is what I use for my business and find their interface easy to navigate. Find local banks with free business checking. If you prefer to bank in person or with a smaller bank, or if online options aren’t available to you, most states have local banks with great checking and savings options for small businesses. As soon as you start your business, you need a system for tracking income and expenses accurately. But you don’t only do this because of the taxes you’ll owe on your profits. Tracking your new company’s finances will allow you to make smarter business decisions. If you don’t keep track of your accounting, you won’t have a sense of how much you spent to land a customer. You won’t know your profit margin for selling or developing a product. And you won’t have a good way of determining when to invest in your business. As a small business owner, you’re also responsible for ensuring that you get paid. So, if you don’t stay on top of your bookkeeping and invoicing, you could end up not getting paid for the work that you do. If you’re new to business finance, the basics of what you need to consider are below. American businesses with revenue under $5 million a year need to determine whether they will use the cash or accrual method of accounting. The difference is when you record transactions. Cash Method: Under the cash method, you record income and expenses when cash changes hands. In other words, you record expenses when you pay for them and revenue when you get paid. Accrual Method: Under the accrual method, you record income and expenses when the service is provided. You may write an article for a client as a freelancer but not be paid for 30 days, but under the accrual method, you record that revenue when you submit the article and keep track of your “accounts receivable” – Revenue you’ve recorded but haven’t received yet. Similarly, if you hire a contractor for work but haven’t paid them yet, you record that expense and keep track of your “accounts payable” – Expenses you’ve recorded but haven’t paid yet. However, there are benefits to the accrual method. Primarily, it allows you to see your company’s profitability in a given time period. 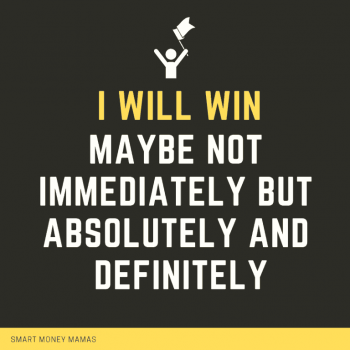 For example, you may win a project that doesn’t pay for 30 days and requires some upfront expenses. In the month you do the work, under the cash method your business performance will look very weak. (Expenses but no revenue.) But under the accrual method, you’ll show your true profit margin. This is why you should track your project costs and income in a spreadsheet or log even if using the cash method for ease. Most new businesses don’t need an accounting tool. Your transactions are few enough that a simple spreadsheet or paper log will suffice. But if you prefer a tool that will walk you through the process, easily categorize your expenses and revenue, and allow you to invoice clients, there are some great resources available. Freshbooks: Starting at $15 per month, Freshbooks is a very popular small business accounting platform with an excellent invoicing system. It is a bit more user friendly than QuickBooks, a major competitor, but does have somewhat fewer accounting and tax tools. Head over for a 30-day free trial. Wave: Completely free, Wave is a complete invoicing, accounting, and receipt scanning tool for freelancers and small businesses. It is the fastest growing small business software out there. And while it may not have all the tools or support you need as your business grows, it is an excellent starting place. If you plan to sell your products or services through Etsy, UpWork, Ebay, or another third-party service, you won’t have to worry about invoicing and accepting payments. The business you’re selling through will handle that. But, if you’re selling through Shopify, your own website, or are providing a service, you’ll need to determine how to receive payments. 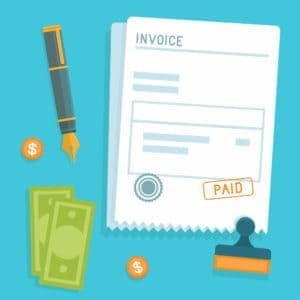 Invoicing: Sending an invoice is a formal request for payment detailing what you sold to your client or customer, the payment required, any sales tax, a payment due date, and accepted payment methods. If you choose not to use an accounting software, try setting alerts in your phone or create a system for marking invoices as paid and the payment date. This makes it easier to follow up with clients or customers who are behind on payments. Payment methods: Paying money to receive your money can be a pain, but in many instances, it’s necessary. If you want to accept credit card payments, you’ll have to pay payment processing fees. Most accounting platforms, such as QuickBooks and Freshbooks, don’t charge a fee to be paid by ACH transfer or direct deposit. You can choose to require that all your customers use a bank transfer, pay by check, or pay your transaction fees, but depending on your business that can limit your customer base. PayPal: Accept all major credit cards through invoicing for 2.9% + $0.30. Fees for refunded transactions are returned. You can also purchase a card reader starting at $24.99 for in-person payments. Swipe or chip transactions pay a 2.7% fee. Receive your money in your PayPal account within minutes. Stripe: Built for online payments and ecommerce platforms, Stripe is excellent for building an online check-out into your own site over sending a customer out to a third-party site to complete their transaction. Fees are 2.9% + $0.30. There are no fees for refund transactions, but the original processing fees are not returned. It takes 7-10 days to get your first payment from Stripe, then you will receive your money on a 2-day rolling basis in the U.S.
Square: Accept online payments from all major credit cards. Also send invoices and/or request a free mag strip reader for in-person transactions. Fees for online payments 2.9% + $0.30. Fees for in-person, point-of-sale transactions 2.75%. Receive your money in 1-2 days. QuickBooks: Build credit card payments from major cards into invoices with a 2.9% + $0.30 fee for online payments. Transactions are automatically matched with their invoices to speed accounting. You can also receive a free card reader to process in person transactions for 2.4% + $0.25. It takes 2 to 3 days for your funds to hit your bank account. Obviously, you want to track all your expenses closely. You don’t want money just running through your fingers. But some things are important to keep a closer eye on than others. Recurring expenses: Web hosting, email service providers, memberships, and any other regular expenses should be closely tracked. It will help you prepare for them and keep a close eye on the ongoing cost of running your business. Meals and entertainment: You can’t deduct meals that you eat at home or in your hometown, but when traveling for business you can deduct 50% of the cost of a meal as a business expense. In addition, if you take a client or potential client out to dinner or a round of golf for business purposes, half of that expense can also be deducted. But the IRS is wary of these charges being abused, so keep all receipts and make note of the business purpose of each event. Vehicle expenses: You can deduct mileage, fuel, and insurance costs for any business related transportation such as driving to a client or conference. However, this is another area that is closely watched so you want to keep careful records of your exact miles driven, dates, and purpose of your trips. High-dollar expenses: If you buy a new camera, laptop, expensive software package, or other service it makes sense to keep records. This is even more important when your business is new, as high expenses relative to income can set off some red flags. You want to have a clear explanation for why that expense was necessary for your business. Advertising expenses: Websites, Facebook ads, t-shirts, business cards. Almost all businesses spend something on advertising. These expenses are recorded on your 1040 Schedule C at the end of the year so you want this information separately tracked. In addition, knowing this figure will help you determine your cost of customer acquisition. Out of town travel: Finally, another place where the IRS is especially wary is out of town travel deductions. They are on the lookout for people masking personal travel as business. Keep records of your business activities along with the receipts. When it comes to actually tracking receipts, you have a number of options. You can put them in an old school folder, tape them to pages in a notebook with a record of what each item was, or create a Google Drive or Dropbox folder where you upload photos or copies of receipts. The IRS doesn’t require you to keep receipts under $75, and you don’t need the originals. A scan or smartphone photo is plenty. But especially for the hot button items above, it is a good practice to keep close track. Speaking of Uncle Sam… He wants his money. When you’re working as a traditional employee, your taxes are withheld from each paycheck. When you’re running a business – even a small business – it is up to you to send in periodic tax payments. Get in the habit of setting aside at least 30% of profits for tax payments. If you will owe more than $1,000 in taxes this year, you need to make estimated quarterly tax payments. While you could calculate exactly how much profit you need to earn to owe $1,000, in general, if you plan to earn more than $4,000 from your small business this year, you should make quarterly tax payments. Underpayment can result in serious penalties and sending in quarterly tax payments is simple. If you use an accounting software and provide it with your other income sources, it can estimate your quarterly tax payments for you and fill out the related forms. Alternatively, you can fill out a Form 1040-ES worksheet to estimate your quarterly taxes. Payments are due April 17, June 15, September 17, and January 15 for the 2018 tax year. EFTPS: The Electronic Federal Tax Payment System requires you to sign up for a pin number to use the service. But it is a secure way to pay your quarterly taxes, get reminders about due dates, and get receipts for payments. It also allows you to pay directly through accounting services like QuickBooks. By Phone: You can pay by phone via debit or credit card but providers do charge a fee for the service based on payment amount and credit card type. And with taxes taken care of, we’re ready for the moment you’ve been waiting for. Actually making some money! It’s time to find your first customers and start making some money! You have your business all set up and ready to go. You know your goals. Now all you need is some sales or clients. If you are selling a product or service, you need to spread the word about your new business. Nobody is going to come knocking on the door just because you set up a website and wrote a business plan. You need to go sell it. But what if you hate sales? Outreach can be a particularly hard step for entrepreneurs that don’t want to feel “salesy” or view sales, in general, as a negative thing. But if you treat talking about your business as an inconvenience for your customers, how will you ever convince them to give you money? Think of outreach as an opportunity to build relationships and help your ideal customer solve the problems in their lives or businesses. Landing your first sale might turn out to be way more difficult than you expected. You may hear “no” more times than you have in your life. You may have to get over emails that go without response or phone calls where the person on the other end hangs up. The second sale is easier than the first. The third easier than the second. And that’s how you grow a business. Let’s talk about spreading the word. Attention bloggers, podcasters, and YouTubers: Growth is going to look different for you. You’re looking to build an audience, not immediately sell someone something. And this naturally takes time. But the benefits of good outreach, discussed below, are the same. The more connections you can make for guest posts, guest appearances, and social shares the faster your platform will grow. Your first set of potential customers is people you already know. Now, you don’t want to pester your friends and family. That can be a strain on relationships. But you can and should let them know about your new venture and provide an easy way for them to help if they are interested. Whether that is sharing your website on social media or keeping you in mind if anyone they know mentions needing a service like yours. Another type of warm lead is anyone you have interacted with before. This could be at a local networking event, on social media, or over the phone. You both know a little bit about each other, so you don’t need to introduce yourself as fully and your outreach should be more personal. 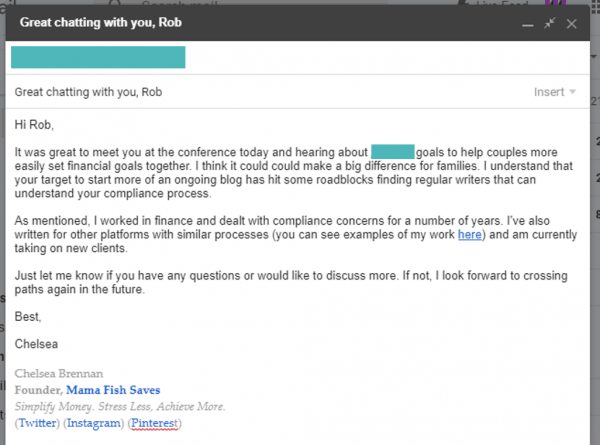 Keep your emails short and be careful not to dive into a hard pitch. You want to inform them about your service, but mostly keep the dialogue open. Playing the line between avoiding a hard sale and still letting your friends or connections know what you want takes some practice. But as long as you stay focused on providing value and understanding what the other person needs (not what you think they need), you’ll start to see responses. Now, the logical next step after warm outreach would be cold outreach, right? The hit rate on cold outreach, unless done very well, is low. As an alternative, social media lets you meet potential customers where they are. Facebook groups related to your business (or your ideal client's business) can be a great place to find leads. On social media you can provide information about your services, provide value through informative posts or live videos, and build a network of others in your field that may be able to help you when you hit issues or even provide referrals. Not every social media platform is right for every business. There will be items on this list that are more relevant to you than others. Choose one or two of the strategies that seem most likely to have results for your business, and focus your efforts there. Create a Facebook post on your business page introducing your business. Share the post on your personal Facebook page letting your friends know you have started a new venture. Join relevant Facebook groups and become a productive member. Search for your service to find groups of people doing what you do – a great forum for advice and for finding clients when someone is overloaded. Also look for groups where your ideal client hangs out. Resist the urge to self-promote. Instead answer people’s questions when you can help, ask your own questions, and view groups as a chance to network. If you do this, people will be more likely to respond when they ask for someone providing your service. Provide value. Use your business page to share helpful (relevant) content, write your own tips on solving a customer’s pain point, or even record short videos with your phone. Share high-quality photos of your product or the behind-the-scenes of making it. In the description, include a call to action to increase interaction with people who see your post. Use hashtags to put your content in front of more people. Interact with others who do what you do or with potential customers. Like and comment on their photos and follow relevant profiles. This will help build your brand and grow more of a following. Tag products in your posts. If you create a shop on your Facebook business page and connect it to your Instagram account, you will be able to tag your products in your Instagram photos. It usually takes a few days to get approval, but will allow you to send viewers directly to your shop. Create a LinkedIn company page and share helpful content. On LinkedIn, you can write articles just like on a blog or a long Facebook post. These can be shared in channels and help provide your expertise to potential customers. 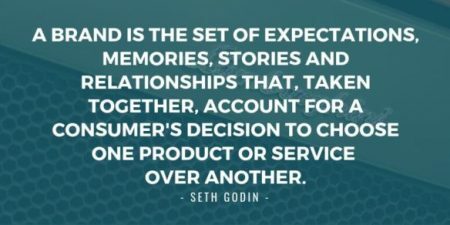 Connect with potential customers. Comment on other people’s blog posts and article shares, use advanced search to connect with others in your field or who are ideal clients, and – just like on Facebook – aim to provide value. When you’re on social media, make sure to stay focused on what you are trying to achieve. You can spend hours scrolling through pretty Instagram photos or stalking old colleagues on LinkedIn. But you’re trying to win clients, not waste time. Try to sit down to work on social media with a plan. For example, “I’m going to post a photo on Instagram, respond to yesterday’s comments, and find 30 relevant photos to like or comment on.” When you’re done, shut the app. Staring at it won’t make someone reach out to buy something or hire you. Everyone is busy. It’s like a big shining badge of honor in today’s society. So to get someone who doesn’t know you at all to answer the phone, read your email, or open your note and respond, you have to make an impact. There are a few ways people fail with cold outreach. But the biggest by far is proposing on the first date. Let’s always remember that with cold outreach this person does not know you and you do not know them. Don’t try to make them buy from you the first time they’ve ever heard from you. Don’t make assumptions about their lives or business. With cold outreach, the goal is to get a response. You want them to hit reply, return your phone call, and start a discussion. To do that, you need to make it about your prospect, not about you. Research your customer: Take the time to review their website, check social media profiles for recent wins or publications, and think about where you can provide value. Avoid the email inbox: Email is the easiest way to reach out to a potential customer, but it is also the most crowded space. Pick up the phone, send a personalized note, or even connect on LinkedIn or in Instagram DMs. Your response rate will be much higher. 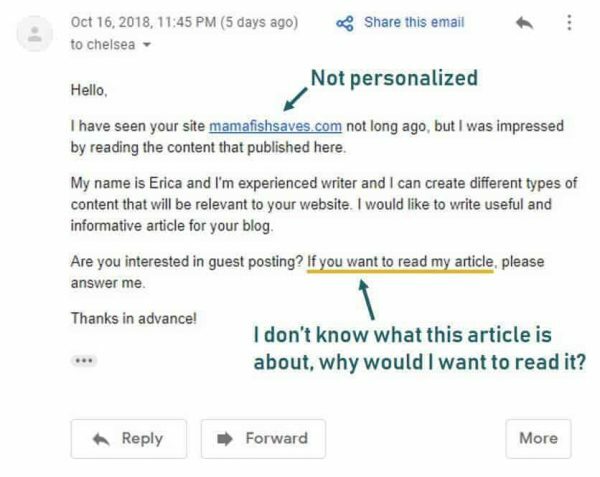 Choose your subject line carefully: If you’re using email, a personalized, short, and engaging subject line can be the difference between your email getting opened or ignored. In fact, 47% of emails are opened or discarded based solely on the subject line. Give them a reason to respond: Why should they take the time out of their schedule to talk to you? Offer some value to a response – do you have a free resource to offer them? A potential business connection? Let them know in your message. Keep it short: Remember that this person doesn’t know you. They don’t need to hear your life story and whole business plan. Keep your outreach to a few sentences, two paragraphs at most, to improve response rates. Follow up: After a reasonable amount of time (5 to 7 days), follow up with your lead. More cold outreach responses come from follow ups than the original message and are an opportunity for you to show that you are a real person, not an automated email blast. Testimonials and referrals can be the best source of growth for a new business. But your time and skills also have value. If you can afford to offer discounts or work for free to build credibility and experience, do so on a very selective basis. Lay out clearly what services or products you’ll provide to the customer to avoid scope creep (them continually asking for more free work.) And, tell them explicitly what you hope to get out of the transaction – referrals or a testimonial if you do a good job. Also be careful to treat any free work exactly like high paying work. Whether you’re working with friends or new contacts, remain professional, communicate on progress, and hit deadlines. “You get what you pay for,” is solidified in most people’s minds. So, in general, people take work they pay for more seriously than work they don’t. Charging something, even if it is a significant discount to your target pricing, can make your client more focused on your performance instead of it being pushed to the back of his or her mind. Maybe you’re trying to work your business in around a full-time job. Or maybe your home with your kids who always seem to need something the moment you open your laptop. Whatever your circumstances, you’ll need a plan to make your business a priority. Despite the appeal of “having it all”, we can’t have everything we want, at full speed, all the time. There just aren’t enough hours in the day. But letting one priority take center stage over another for a time is alright. And if you want to fit a new business into your life, you’ll have to make some trade-offs. This is going to look different depending on your life. Growing your business might mean your nightly Netflix session needs to be nixed so you can use those quiet hours while the kids are in bed to work. It might mean making more big meals so you can skip cooking a few nights a week to eat leftovers. Or maybe you have to say “no” to volunteering at every PTA event. Look over your schedule and ask yourself, “what is the most important thing to me right now?” Then ditch or dial back the tasks that aren’t driving you forward. Focusing on your business doesn’t mean that other things aren’t important to you. It doesn’t mean you can’t come back to them. You’re simply telling yourself what your priority is right now. It’s unlikely that you have hours of open time in your schedule to work on your business. And shoving it into random 15-minute increments might work, but you’ll be sending a message to yourself and your clients that your business isn’t a priority. You need to set a schedule. Now, you have to be realistic. Without a lot of help, you’re unlikely to be able to work eight hours a day, five or six days a week. But even setting aside one hour time blocks a few times during the week can help you build momentum. Once you decide on your schedule, share it with your family. Let them know that at those times, you’re unavailable. Find a quiet spot, or head out to a coffee shop or library if possible, and do your work. Remember that once you have a schedule, you have to stick to it. If during your morning work session you’re stopping to tell your spouse a story or see your child doing somersaults, you’ll be giving your family permission to interrupt you for other things. 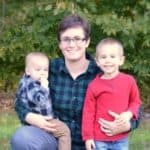 The first year of Mama Fish Saves (Smart Money Mamas’ original name) I was working more than full time, spending 20 to 30 hours a week on the blog, had a baby boy, and was pregnant for most of the year. It was hectic. Luckily, I had my husband. He did dishes, cooked, folded laundry, cleaned the house, and did virtually everything while I hustled that year. Without him, I couldn’t have committed half the time to the blog as I did. But he knew the site was important to me and knew he could help by picking up some of my duties for a while. Don’t try to be an island. Whether you’re trying to start a small business to bring in an extra $1,000 a month or replace your full-time job, you’re going to be carving time out of an already busy schedule. Share your goals with your spouse and friends. Tell them your plans to get there. And ask for help. That could look like your spouse doing a little more around the house. Or setting up a weekly childcare swap with a friend so you each have a day to yourselves. Or your mom babysitting one night a week so you can go to a networking event. The level of support doesn’t have to be a big thing. But the knowledge that the people you care about are invested in your success can carry you through the harder times. And that little bit of extra time to work makes it even more likely that you’ll succeed. There are thousands of tools, courses, and places to outsource in your business. It’s important to make sure you’re spending where you’ll get the most bang for your buck! It’s easy to throw money at a problem. It’s hard to determine when that money will actually help you fix your problem. With a new business, it’s tempting to purchase all the perfect tools, courses, advertising, and more. But in most cases you really need very little to get started. As you grow, don’t fall into the trap of comparing your beginning to someone else’s middle. Just because someone you idolize in your space uses a specific tool or recommends a course doesn’t mean you need it today. Chances are, they probably didn’t use the expensive email service provider or scheduling tool until they were making enough money to support it. Here’s how you can invest carefully. There will always be some new tool, app, resource you need to buy today. Always. If you let yourself purchase everything that looks interesting or helpful, you’ll never have any profit to take out of your business. Instead, you have to be thoughtful about your purchases. Before buying anything, ask yourself these questions. Does this bring profit to my business? Does the tool you’re looking at help you get more customers, spend significantly less time on back end work so you can spend more time with clients, or help you offer services current customers are demanding? Are the benefits of this product in line with my current goals? The worst kind of failure is success at the wrong thing. If your dream is to be a photographer, don’t buy video equipment just because it can secure you one customer today. Make investments for the longer-term. Are there things I’ve already purchased that I’m not fully utilizing? If you’re justifying the cost of a new tool by how much time it will save you or how many new clients you’ll get, consider the last time you made a purchase with the same reasoning. Have you gotten the most benefit out of it as possible? Get the value of money already spent before buying another tool. Set a budget for tools and stick to it. If you see a sale, chances are it will come around again. With simple spreadsheets, an email account, and a low-cost website you can do almost everything you need to do for an online business. Hone your skill, earn some money, and then revisit additional tools when they are truly needed. For more traditional businesses, don’t overbuy. Stick to the core resources you need, rent where possible, and build a set of quality tools as your business grows. I’m an online course junkie. I’ve paid for far too many of them, sometimes not even finishing the course work before buying a new course. It plagued the first year of my blog. I was inundated with content promising the “secret code” and fast results. And the information in the courses was often conflicting, which left me paralyzed wondering what to do. But I’ll tell you the real secret code. Even the best step-by-step courses only work if you do. There are courses out there teaching you how to grow a blog, become a life coach, manage Facebook ads for local businesses, improve your photography skills and more. Some online courses are 100% worth it. Others aren’t. But the most important thing is to choose a course that offers teachings in line with your goals and where you currently are in your business, go through the content, and implement it. Is the information presented in a way that’s in line with how you learn? If you learn visually, is the content in video format with real examples? If you prefer to read and absorb, are there transcripts or ebooks that go along with the course? Is there evidence of prior student’s success? Look for testimonials, visit the sites of the providers, and talk to other students if possible before purchasing a course. What are the teacher’s credentials? Do they have experience in your field? Are they teaching a general system for success or only presenting the system that worked for them? You want a teacher who isn’t only good at what they do, but good at teaching it. Have you followed the teacher’s free content? If free downloads, blog posts, and videos created by the instructor felt valuable, it is more likely the course will be valuable. Is there a course community and is the teacher active in that community? For many of the best courses, the value is in the community. A group of people testing the strategies, answering questions, and getting new, updated insights from the teacher. Courses can be very effective, but commit at least 6 months to learning, implementing, and testing any course. Don’t allow yourself to get overwhelmed with far too many voices telling you different things. Full disclosure: I am a small business coach and my mom has long been a life coach and coach for small-to-medium-sized businesses. 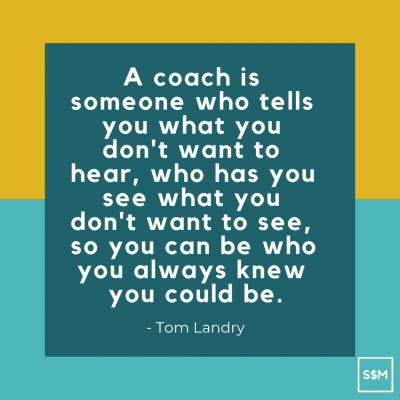 I’ve used and loved working with coaches. We hire coaches to help us improve our golf shot, get in shape, make it through childbirth, and apply to college. Why not look for that same support and accountability in business? I fully believe coaching can make a business grow more quickly or get to the next level. You’ll have someone to help you find solutions to problems, keep you accountable, and encourage you through the tough times. If you’re someone who tends to overthink things (or not do them at all) when working alone, a business coach could be an excellent investment. But if budgets are tight there are other options to access accountability. Masterminds are groups of entrepreneurs around the same level as you, that meet regularly to check-in on each other’s progress, set goals, and problem solve. It’s a form of peer-to-peer coaching. There are free and paid masterminds, but paid masterminds do usually have a traditional coaching component with at least one “expert” member. If you’re looking for some accountability, you can find mastermind communities either specific to our niche or in your local community. You can also create one by reaching out to friends or business communities to find interested members. Keep the group small. An ideal mastermind group is 4 to 6 members. This is enough people to add a variety of opinions while making sure everyone gets the individual support they need. Make sure members have similar goals. I’ve been in masterminds before where some members are 100% focused on growth and others are just dipping their toe in the water. It screws with the energy of meetings and is generally less effective. Find people who are similar to you, even if that means screening them first with a few questions. Set a regular time to meet. Will you meet every Monday morning, like my mastermind? Or the second Wednesday of every month? Let people know the frequency they are committing too. And set a specific time to avoid scheduling nightmares. Have a meeting structure. Creating an agenda to follow at every meeting will guarantee that members get value from the time they spend together. The best time to invest in a business coach or paid mastermind is when you are feeling stuck. When you’ve tried to get off the ground, solve a problem, or break through the next level for a while and just don’t know what to do next. This is the investment that leads you through. Just remember to find a coach (or mastermind leader) that has experience with your problem or field and has a personality that works well with yours (don’t hire a tough love coach if you respond better to praise). And don’t overstretch yourself. $20,000 coaches and masterminds are generally designed for entrepreneurs already making significant income in their business and are priced that way as a hurdle to make sure those who sign up are committed. Spending massive amounts to work with coaches who work with your idols won’t guarantee success. In fact, it might mean working with a coach who is unfamiliar with the struggles of a new or small business. Our time is limited. And our unique skills might not be suited for writing sales copy or editing video for our YouTube channel. Many business owners wait too long to think about outsourcing. They view it as paying for something they could do for free, by doing it themselves. But your time has value. Ever hour you spend struggling with something that doesn’t earn money for your business is time that might have been better spent. 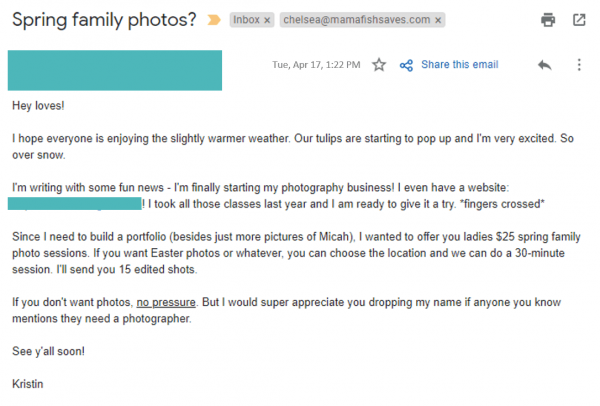 When my website was just over a year old, I hired a Pinterest manager. Pinterest drove great traffic to the site and I didn’t want to abandon the avenue. But making images took me over an hour per post. So outsourcing, even though the site wasn’t making much money then, freed up about 5 hours a week for me to do the things that actually grew my business. Writing posts, creating products, building relationships. And I still got the benefit of Pinterest growth – done by someone who loved Pinterest and was good at it. It jump-started my business growth. Important revenue-generating activities aren’t getting done because you’re spending too much time on back end work. Stuck in piles of emails, updating your website, scheduling meetings, or editing audio when you could be working? Outsourcing a few hours a week to a virtual assistant could give you the breathing room you need to grow. You know what your time is worth. Take your revenue and divide it by the hours you spend on any activity that actually generates that income. That’s your hourly worth. If you can earn $100 an hour freelance writing, hiring a $20/hr assistant to free up more of your time to write is an excellent arbitrage. You know what your skill set is. Sometimes we have to do things for our business that we simply don’t know much about. We could spend hours (or days or weeks) learning a new skill we may rarely if ever use again. Or we could hire someone who is an expert. You’re willing to sacrifice some profit in the short-term for freedom. Entrepreneurs are more prone to burnout than almost any other group. We run ourselves ragged working 24/7/365. But you can’t do that forever. When you’re earning enough, put systems in place to delegate tasks to qualified outside sources. The cost might hurt at first, but you will likely find that your freed up mental space will make your business healthier and more profitable over time. Obviously, you can’t hire a team when your business doesn’t have income, clients, or an audience to serve. But as you start to earn money, don’t discount the power of outsourcing in the right places. It can be rocket fuel for your growing business. Success doesn’t come quickly. Find a supportive community and give yourself time to grow. In this guide, I’ve tried to give you the most fulsome, realistic steps it will take to grow your business. But that first year slog is a tough one no matter what. Stay committed. It gets easier. As your business grows, you’ll create systems to save you time, find it’s easier to get new clients (yay, referrals! ), and slowly feel like the boss you are. Entrepreneurship is becoming more normal. You probably have at least one friend that is walking the same journey as you. But growing a business is a unique struggle – you need to find your people. I wouldn’t have gotten through my first year without finding other people working towards the same goal. It gave me a place to talk about my budding business without getting strange looks from people. Or the, “Well, that sounds nice,” comments of dismissal. My mastermind and the community in Blogger U keep me sane. They don’t tell me to just quit when things are hard. We fight forward together. If your spouse, friends, or family aren’t supportive of your business idea – or they try to be supportive without the ability to understand what you’re really doing – reach out to others in your field. Join free Facebook groups, find an accountability buddy, or join a paid community. This road is easier, and way more fun, with friends. 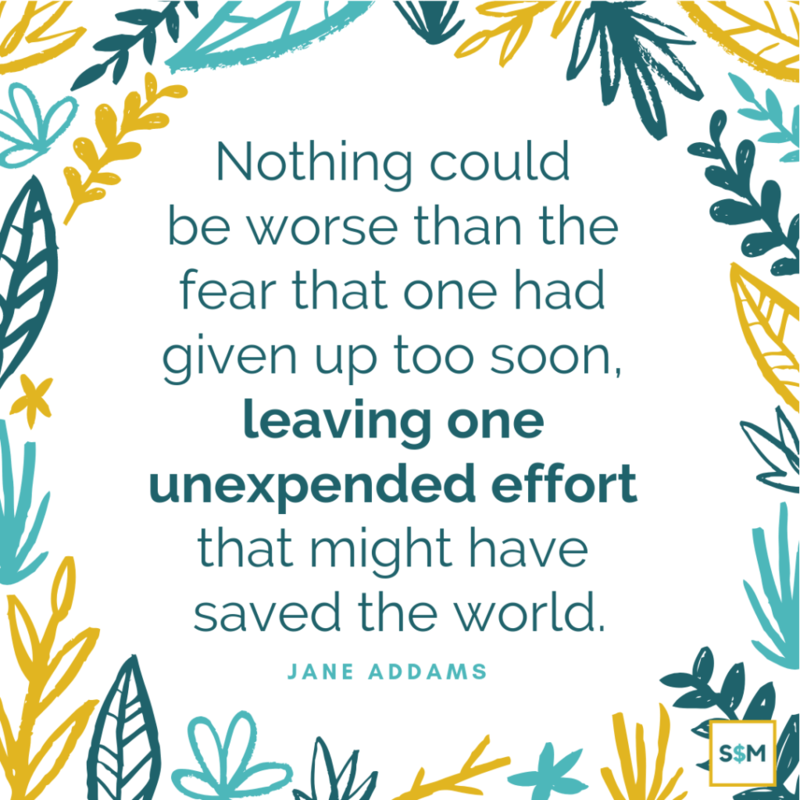 Don't Give Up Too Soon, You Can Do This! I wanted to quit my business after 3 months. I almost quit again at 6 months. At 10 months, I was considering closing down the site and starting a completely different one. I’m so, so glad I didn’t. Because on the back end of every tough time I pushed through was the growth I had been craving. You have the skills you need to make your business successful. You’ll have days when you’ll want nothing more than to quit. But you’ll also have days where you’re energized and just loving every moment of growing something special, designing the life you want. As you get started, remember that success is often just on the other side of “I don’t think I can do this.” Keep pushing! You’ve got this! What kind of business do you want to create? Why? Share in the comments so we can cheer you on! Hi, I’m Chelsea! I’m the founder of Smart Money Mamas and I’m almost embarrassingly passionate about reducing money stress for moms. As an ex-hedge fund investor, I’m an investment pro. I’m also a certified National Financial Education Instructor, mom to two hilarious young boys, and wife to my amazing husband (who’s a stay-at-home dad!). Let’s do great things together! Start making money with over 200 ideas & a complete guide!